Last Sunday in our service at Grace Family Fellowship, we looked at some of our holiday traditions from a spiritual/Biblical point of view. I wanted to share the notes from that message for folks to review (or see for the first time!). There was a story/poem that provided the framework and I added some scripture to illustrate the points. I hope that the thoughts and words here can add some depth and significance to the things we all see so often at the time of year. Just last Christmas Eve I had a strange visitor. This is how it happened: I had just finished the household chores for the night and was preparing to go to bed when I heard a noise in the front of the house. I opened the door of the front room, and to my surprise, I saw Santa Claus himself stepping out from behind the Christmas tree. He placed his fingers over his lips so I wouldn’t cry out. “What are you doing here…” I started to ask, but the words choked up in my throat as I saw that he had tears in his eyes. His usual jolly manner was gone. Gone was the eager, boisterous soul we all know. As I stood there in my robe bewildered, Santa said, “We’ve done it all wrong. You need to teach the children.” My perplexed expression still showed in the near darkness. Fumbling in his sack, he drew forth a bright shining gold star. “Do not be afraid. I bring you good news of great joy that will be for all the people. 11 Today in the town of David a Savior has been born to you; he is Christ the Lord. 9 After they had heard the king, they went on their way, and the star they had seen in the east went ahead of them until it stopped over the place where the child was. 10 When they saw the star, they were overjoyed. 11 On coming to the house, they saw the child with his mother Mary, and they bowed down and worshiped him. Then they opened their treasures and presented him with gifts of gold and of incense and of myrrh. Santa gently laid the star upon the fireplace mantle…and drew forth from the bag a glittering red Christmas ornament. “Teach the children, red is the first color of Christmas. It was first used by the faithful people to remind them of the blood which was shed for all people by the Savior. Jesus Christ gave his life and shed his blood that every man might have God’s gift to all, eternal life. Red is deep, intense, vivid. It is the greatest color of all. It is the symbol of the gift of God.” As Santa was twisting and pulling another object out of his bag, I heard the kitchen clock begin to strike twelve. I wanted to say something, but he went right on. “Teach the children”, he said as the twisting and pulling suddenly dislodged a small Christmas tree from the depths of the toy bag. He placed it before the mantle and gently hung the red ornament on the Christmas tree. The deep green of the fir tree was perfect background for the ornament. Here was the second color of Christmas. “The pure color of the stately fir tree remains green all year round,” he said. “This depicts the everlasting hope of mankind, and the everlasting life we can only get through His Son. Santa’s eyes were beginning to twinkle now as he stood there. Suddenly I heard a soft tinkling sound. As it grew louder, it seemed like the sound of long ago. 14 “I am the good shepherd; I know my sheep and my sheep know me— 15 just as the Father knows me and I know the Father—and I lay down my life for the sheep. As the soft sound of the bell faded into the night, Santa drew forth a candle. He placed it on the mantle and the soft glow from its tiny flame cast an eerie glow about the darkened room. Odd shapes in the shadow slowly danced and weaved upon the walls. “Teach the children,” whispered Santa, “that the candle shows man’s thanks for the star of long ago. It signifies the Light that shines within all God’s people. A light that should never be hidden. It’s flame seems very weak, but it chases away the darkness, just as the stars do. It’s small light is the mirror of starlight. 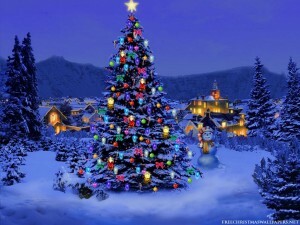 At first candles were placed on the Christmas Tree—they were like many glowing stars shining against the dark green. Santa turned the small Christmas tree lights on and picked up a gift from under the tree. He pointed to the large bow ribbon and said, “Teach the children. A bow is placed on a present to remind us of the spirit of the brotherhood of man. We should remember that the bow is tied as men should be tied ~ all of us together, with the bonds of good will and love toward each other. “Teach the children that the candy cane represents the shepherds crook. The crook on the staff helps bring back the strayed sheep to the fold. The candy cane represents the helping hand we should show at Christmas time. The candy is the symbol that we are our brother’s keeper. Santa then paused. He seemed to realize he should be on his way. Later would be his big day. As he looked about the room, a feeling of satisfaction and relief showed in his face. He reached into his bag and brought forth a large holly wreath. He placed it on the fireplace and said, “Please teach the children that the wreath symbolizes the eternal nature of God’s love; it never ceases, stops or ends. It is one continuous round of affection. As I gazed at the wreath, he slipped away, his job done….pointing people back to the real meaning behind this celebration. I pondered and wondered and thrilled with delight, As I saw and viewed all those symbols that night. I dozed as I sat in the soft candle light, And my thoughts were of Jesus and all He made right. To give and to help, to love and to serve, Are the best things of life, all men can deserve. Old Santa Claus that jolly fat little elf, Is not the best symbol of Christmas itself. Jesus gave us the gift of love and of life, The ending of evil, the ceasing of strife. Santa’s message to me on the pre-Christmas night, Has opened a treasure of deepest insight. The one thing on earth we all ought to do, Is the teaching of children the right and the true. May you have a blessed Christmas… Remembering how much God loves you! Our Christmas Eve service will be Monday, December 24th (that’s a shocker) at 5:30pm in the Fellowship Hall of Hilltop Community Church (where we meet on Sundays). The service will be about one hour.